Today’s stitch explodes an old stand by stitch, making it perfect for a small to medium-sized area with shading. The stitched sample is from our friends The Marquis Sisters (@themarquissisters on instagram) and uses Straw Silk on the ground of an adorable Raymond Crawford rooster. It’s a great thread choice for the area AND this stitch as the color variations on the thread work perfectly with the colors of the painted ground. Clearly, the stitch is perfect for a ground cover and, by extension, a green field. I would love to see it as a floor with two different colors. It would be a charming sky with a lightweight Silk Perle or even choppy water with Petite Silk Lame. Today's stitch is a distant cousin of Brick Beading with a little surprise. It’s a great way to draw attention to a small space and super easy. Add the beads first, follow with the squares. I would love to see it as water, using Kreinik or Petite Silk Lame along with a bead. It would make a cute party hat with Neon Rays and beads. I want to play with it for a bird using variegated silk floss and maybe a Hex bead. I might have to get on that one sooner rather than later. I am very grateful for my stitching friends and students who share their stitched samples with me and, ultimately, us. And it’s always fun when I learn a new stitch. This week’s stitch is even more special because, honestly, I probably would have never stitched it had I not seen the stitched sample. 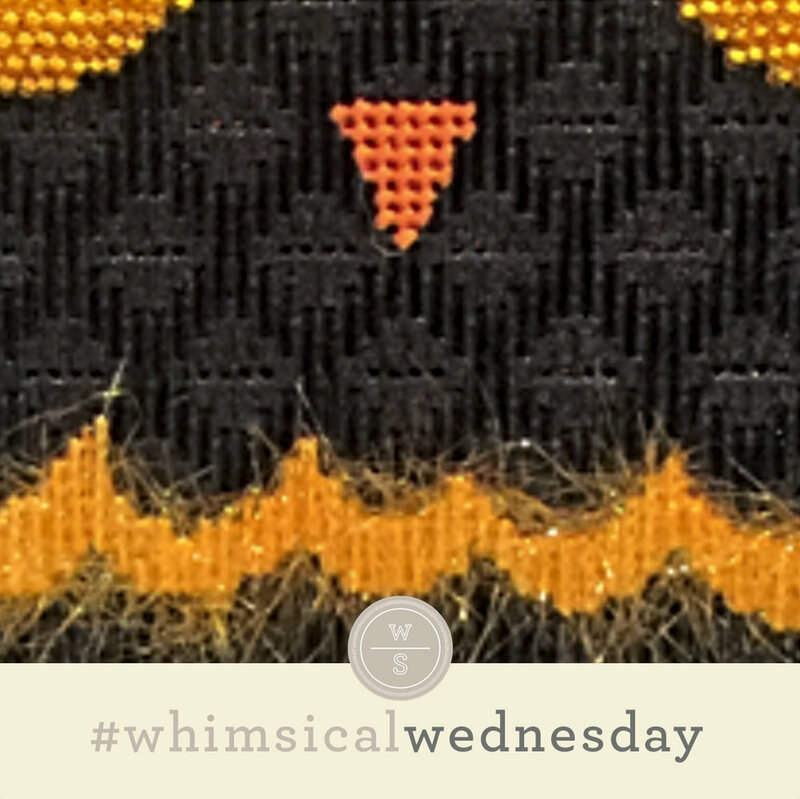 Today's stitched sample uses Burmilana (black lines), silk floss (aqua lines), and a Kreinik Metallic (yellow lines). 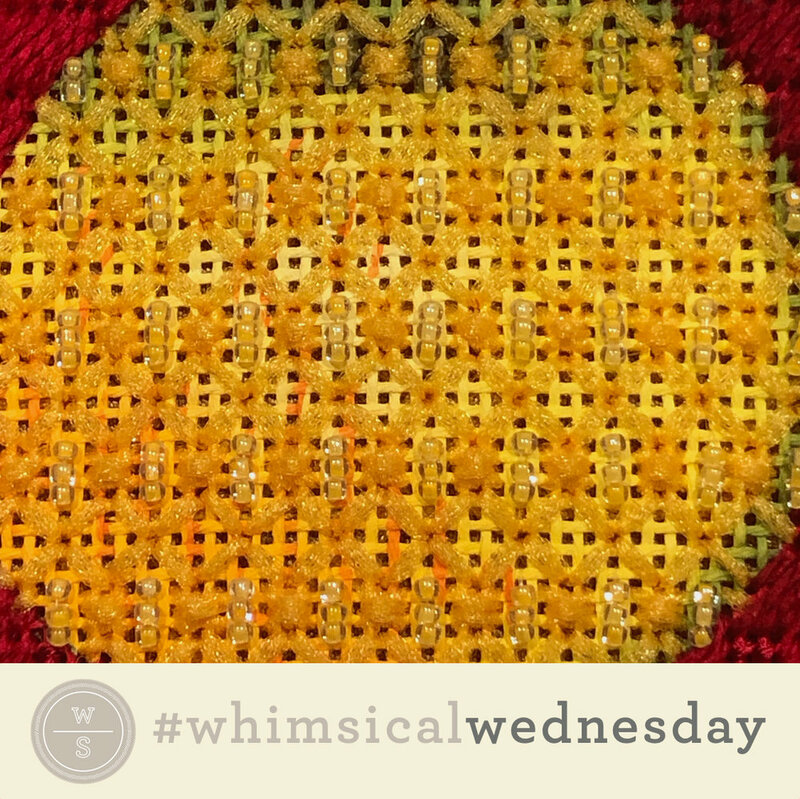 The stitcher used French Knots instead of single stitches for the yellow lines. As you may recall, I favor open stitches so, at first pass, this stitch diagram came across as oh so heavy to me. But I really love the use of three colors and how the single stitches are a great accent that really livens this stitch up. Clothing, roof, floor, bags, water. This stitch could cover all of them well. For me, the point of this stitch is color. Have fun with the color combos. Consider purple, green, and orange for Halloween. Consider, red, orange, and lavender for a fun dress. Clearly, you could have fun with the more well known combo of red, white, and blue or red, white, and green. Consider gray, yellow, and turquoise. Play with colors! Visiting stores across the country, whether as a teacher or an intrigued tourist, is always enjoyable. I love to get a grasp of the local style through what canvases and threads the stores carry. The stitched samples are often the best representations...and provide ongoing stitch inspiration. Today's stitch and stitched sample come from Becky Booth of The Knotted Needle in Grosse Point. It uses overdyed silk floss (likely Gloriana or ThreadWorx). This is a background on a rather large piece. Using a single thread keeps the stitch interesting yet doesn't allow it to overwhelm the remainder of the piece. If you wanted to dress this up a bit, alternate finishes between horizontal columns of stitches. This would also be beautiful with an overdyed silk floss and Petite Silk Lame or a lightweight Kreinik. I think this would be a fantastic stitch for a large body of water; the offset of the columns enhances the shapes of the "wave" stitches. I Can't Wait to Show You the Wrong One! A funny thing happened on the way to creating today's diagram. I got it way wrong. I would have kept going down that path...because it was pretty fantastic...were it not for the already stitched sample. I promise to share my mistake once I'm able to stitch it up. In the interim, please enjoy today's stitch. The stitched sample uses Trebizond Silk (light gray lines), Kreinik Metallics Fine Braid (#8) (turquoise lines), and Flair (dark gray lines) on 18-mesh. Continuing the theme from last week, this is another fantastic open stitch to highlight some of our industry's most beautiful painting. This stitch could be very intriguing as water, as the Upright Crosses could add a little choppiness to said water. I would play with Petite Silk Lame, Kreinik, and maybe some Soie D'Alger or Princess Perle. Stitches like these lend themselves to dramatic clothing. Very Velvet or any single strand silk would add a richness in color and weight that would make this stand out even more. The center X would be great with Entice or Fyre Werks. I would replace the Upright Cross that is in the center of the diamonds with a bead in that scenario. Every time I see this stitch, I see a different path to stitch it. This is the perfect example of how not every numbering pattern is for everyone. What's more important is that it is a cute and effective stitch. 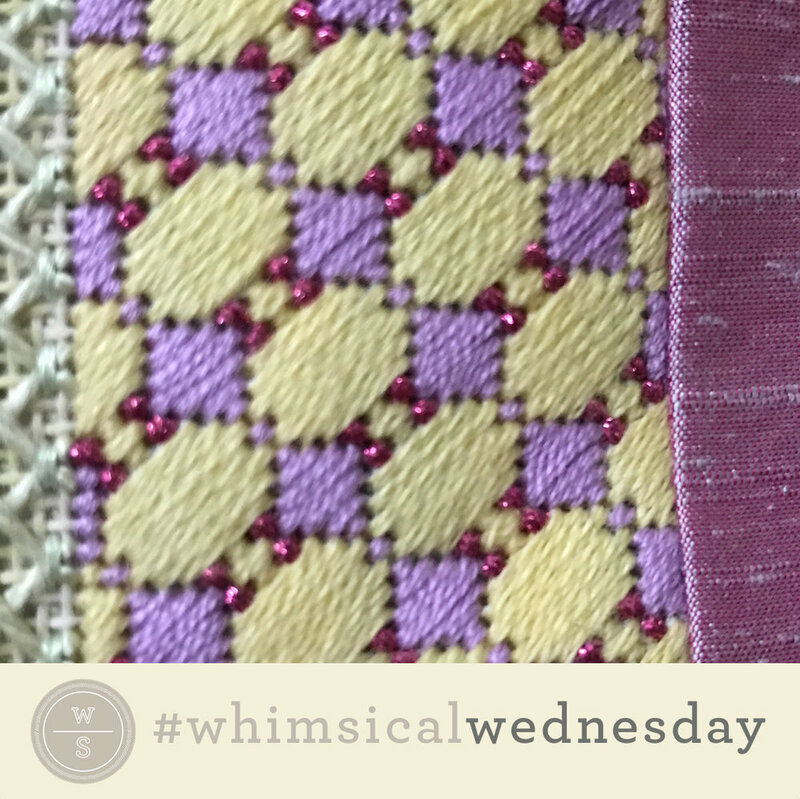 This stitched sample is a roof from Emma Williams Rooftops stitch guide, using DMC Perle Cotton #8 on 13-mesh. The shading on this canvas is exquisite and I went out of my way to expose it or integrate the color schemes of the individual roofs into an appropriate full coverage stitch. This stitch accentuates shading in a great way as the open areas are not a traditional shape nor are they on perfect 90° or 45° angles. It's intriguing to me. Technically, it's a small stitch, yet I wouldn't classify it as such because of the open areas. I think this would make great water as, at first glance, it's a little messy. Long-time readers may recall my go-to threads for water are Petite Silk Lame and/or a lightweight Kreinik Metallic. It would be very interesting as a tree or green space with Lorikeet, Burmilana, or ThreadWorx overdyed floss or wools. To close the loop on numbering from earlier. This is such a perfect example of how numbering is in the eyes of the beholder. The first time I stitched it, I stitched similar squares from right to left on a downward oblique angle (essentially skipping a row across). When I returned to it, I stitched it in horizontal columns, skipping two rows in between and returning up the horizontal column with the squares in the other direction. It's all a matter of perspective. Neither way was better or easier. It was simply the way I saw it at that given time. Quick heads up. Wing stitches were a big part of my life for a couple months recently as I worked on several bird canvases. And that's where today's little gem came from. The stitched sample is me playing with Petite Silk Lame on 18-mesh. It's subtle, easy, and a very sweet stitch. Any shading will show through the skipped row, making this even sweeter. As I mentioned, I used this stitch for a student's small bird, alternating royal blue and turquoise threads in the vertical columns. I love the idea of this as a small body of water, using a lightweight Kreinik, Petite Silk Lame or a sky. The simplicity of the stitch is enhanced by the subtle directional element. If you like what you see on this blog, want to learn some very creative decorative stitches, and how to put them all together, whimsicalstitch.com sells stitch guides and stitch concepts for Melissa Shirley Designs, Zecca Designs, and Patience Brewster. 91 guides are currently available, with 20 new Stitch Concepts just added! Click here to see the newest guides and click here to see the entire collection.